Ok folks, here’s an update keeping me accountable… maybe. I posted a few weeks ago about how I signed up for Lifetime Fitness’ 90 Day Challenge. It’s not for one specific genre of person, but can be beneficial for anyone to refocus nutrition and fitness after the holidays. In an effort to be transparent, here’s an update on how it’s going. I started at 176.1 pounds on weigh-in weekend on 2/6 and 6.4 percent body fat. Today (3/8) I weighed in at 177.9 and 5.5 percent body fat. I have an ideal body weight of 165 for racing season, but I also want to stay in a healthy range for body fat and not force my body into muscle catabolism and eat muscle by not getting enough calories to compensate for training. It’s a delicate balance of nutrition and training. Still working on it as you can see since I’m up in weight, but down in body fat. The fluctuation is minimal and typical for me from day to day. The In Body scale is also very sensitive to recent meals and fluid intake. So… breakfast, hydration or lack thereof can shift the numbers. BUT, I would like to see the body weight go down and from the trend on the chart, it was going the right way, but spiked up this week. Could be the cake we had for Daughter #1’s birthday. 🙂 Saved leftovers for day off meal day and made sure the evidence was gone before the end of the day. Don’t worry, I had help. 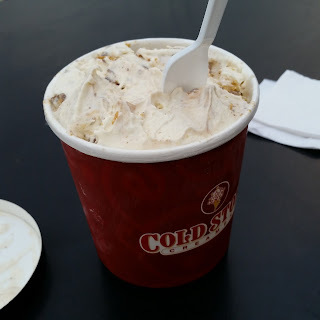 I’ve also been known to indulge in 32 ounces of pure heaven, like Cold Stone oatmeal cookie batter ice cream with Reece’s Peanut Butter Cups on off meal days. Ya, it doesn’t help, but you still have to live and indulge where you can. 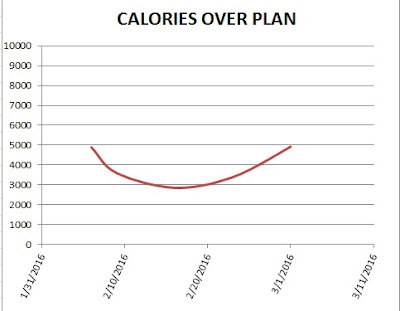 I have been tracking calories. I use MyFitness Pal to track my calories. I have been for a while now. Over a race season, I have a higher allowance, but during base (fall through winter) building, I back it down since there’s less intensity and volume and more drills and technique work. Keep in mind, I DO NOT add my workouts into the app since it will adjust your target. I separate nutrition and track workouts on Garmin Connect and do not sync them. During the holidays, the weekly overage had been from 7000 to sometimes 9500 calories over for a week. That happens with pumpkin pies and Christmas cookies. Lets keep it real. But, days on were within range, but I timed off days with Tday meals, Christmas treats, birthdays, etc. So when it was off meal days, it was ALL OUT and GAME ON. Now it’s time to bring that back in, queue 90 Day Challenge. Change a lifestyle choice, track the changes. Right now, I’m adding a little more training volume, but I’m more focused on daily nutrition being spot on and not going so insane on the off day. Cold Stone 32 ounces is till my weakness, but I try and keep the rest of off day as normal as possible. So far I have had success, with last week being a little off with a regular day being at capacity with unscheduled chips and dip that affected the week numbers. But, you have to live a little and be ok with every day not being perfect. Lets be real and lets be human. Trending the wrong direction with weight, but I need to stay the course. Body fat is staying in a good range, but I need to be more diligent with regular days, but be better with staying on the rails on off days for food. Food is fuel, but sometimes you need to live life and hit the 87 octane and take a day off from 98, know what I mean? It also helps that we are now done with birthdays in our house until July. We have Easter to survive with the baskets of candy and jelly beans…. ahhhh jelly beans…. what? SQUIRREL! I should be able to stay on track, but who knows what curve balls will come my way, like free Chipotle burrito coupons. Damn you, Chipotle!